Today’s museums would be almost entirely unrecognizable to a visitor from the 19th century, when many of our most venerable institutions first opened their doors to edify and enlighten the public. Their galleries would have been eerily silent, so as to facilitate quiet reverence for the objects on display, and solemn contemplation of narratives crafted by an invisible cadre of curators that was hidden away in a proverbial ivory tower. The museum visit was a ‘civilizing ritual,’ through which ideologies—presented as unbiased presentations of facts—were conveyed and dominant cultural values affirmed. But museums, by and large, have made significant strides in shedding this troublesome identity and transforming themselves into lively civic forums, where curators and visitors co-construct knowledge and meaning through ongoing dialogue. This dynamic discourse is happening in a variety of environments, including highly-interactive exhibits, on-site public programs, online activity, and even social media. Despite this exciting evolution, museums—not unlike other aging institutions ranging from print journalism to bricks-and-mortar bookstores—are struggling to articulate their relevance and value in today’s society. The American Alliance of Museums (AAM) is ardently and, I would argue, rightfully positioning them as essential educational institutions and community anchors. The Center for the Future of Museums, an AAM initiative, expounds upon this premise and posits that museums will play a vital role in an emerging era of education, wherein an outmoded, school-based system will be replaced with a networked landscape of distributed resources that encompasses not only museums, but also libraries, online education portals, and community organizations that provide learning opportunities outside the traditional classroom environment. Whether or not this systemic shift in the way we think about education occurs, museums, I would insist, are uniquely positioned to play a prominent role in fostering the knowledge, skills, and dispositions that underpin widespread participation in public life—in other words, the sort of education that is essential to sustaining a healthy democracy. This work inspires me and continuously informs the way I think about our traveling museum, the Freedom Express. The idea of fostering civic learning and engagement is woven into our institutional DNA, and our exhibit content is tailor-made for this endeavor. The museum illustrates how the First Amendment enables a healthy democracy, where we can freely exchange ideas, learn from a diversity of perspectives, and take action on the issues that matter to us. Yes, we want visitors to understand our constitutional rights and their historical context. But, just as importantly, we want to generate discussion, spark debate, and inspire visitors to create positive change in our communities. We, along with so many of our colleagues at Cantigny Park and across the country, are embracing the museum’s potential as a powerful and enduring catalyst for civic engagement. Courtney oversees the Foundation’s mobile museum, the Freedom Express, which travels to schools and community events throughout Chicagoland. The Foundation also encompasses two bricks-and-mortar museums at Cantigny Park in Wheaton: the First Division Museum and the Robert R. McCormick Museum. Illinois police officers would like to put themselves out of business. But not because they’re looking for an early retirement, they’d just prefer to see kids in a cap and gown than an orange jumpsuit. In September, nine representatives of the Illinois police force came together at the Cook County Jail to promote a seemingly unconventional crime fighting strategy: early childhood education. These officers have teamed up with Fight Crime: Invest in Kids Illinois, a Robert R. McCormick Foundation grantee, to help the public understand that the path to that orange jumpsuit starts at birth. The organization partners with law enforcement officials across the state of Illinois to prevent crime and educate the public on strategies and policies that can help keep kids in school and out of jails. It was a powerful image to watch inmates mill about as Sherriff Tom Dart and police chiefs from Cook County and surrounding suburbs called upon Congress to implement a proposed state-federal partnership that would expand high-quality early learning opportunities for Illinois students. Their recently released report, “I’m the Guy You Pay Later” gives shocking statistics that show investment in these opportunities could save money, and more importantly, our children. While crime prevention may seem like an unusual reason to support early care and education, it is critical to understanding the importance of ensuring the safety and well-being of our youngest children through public and private high-quality early learning programs. We’re proud to support the efforts of Fight Crime Illinois and hope to see this state-federal partnership become a reality. It’s time to give access to early education to all children so we can improve lives, support our communities and support our dedicated law enforcement officers. I was 17 years old and nervously clutching to the recording device my high school journalism advisor had lent me. I was standing at the back of a press section as thousands of people listened intently to presidential candidate Barack Obama; he had yet to be elected. He stood before us promising change, reform, an end to the war and much more. To this day, I’m not sure if the campaign staff was aware that I was merely a high school journalism student, but I was there and I was inspired. I was inspired by Obama, democracy, the promise of change and most importantly, I was inspired by journalism. A year later, I was on my way to Loyola University of Chicago to begin my major in journalism. In my three and a half years there, I had some amazing moments. I was writing as the School of Communication’s personal journalist, I covered Chicago City Council meetings while Alderman Sandi Jackson was in the hot seat for her husband’s misuse of campaign funds and I reported on Chicago radio waves when Obama won his second term in office. All of it was thrilling, but it was missing something. When I chose to go into the journalism field, a fair share of warnings came my way… I knew very well that print journalism was suffering, but what I didn’t realize was that journalism as a whole was suffering too. All it takes is a quick look at the Pew Research website to see that the American people were losing faith in reporters, and as a former journalism student, I know that the reporters themselves are losing a little faith. True watchdog reporting has been replaced with fancy graphics and opinionated banter. A profession that prides itself on integrity, ethics and the common good has sacrificed its well-meaning origins for higher ratings. On air, the listeners would get 30 seconds of insight into the Arab Spring, 30 seconds allotted for a movement that would forever change the global environment and American foreign policy. I could go on forever lamenting, but the point is, I needed to get out. Graduation was coming at me fast and being a part of the profession I had paid thousands of dollars to learn about didn’t seem to be in the cards. Most logical people probably would have taken some time to formulate a plan… I, on the other hand, moved to Stockholm. A job in Sweden with a think tank that focused on peace research was something that I knew I could stand behind. Five months later, you’ll find me here at my desk at the McCormick Foundation, working on press releases and social media. To be honest, I never saw myself behind a desk; but when I think about my seventeen-year-old self and my nervous hands gripping that recorder, I know I chose the right path. The McCormick Foundation was founded by Robert R. McCormick, former owner and publisher of the Chicago Tribune. McCormick gave all of his belongings to create an organization that would be committed to sustaining a strong and free news media and enriching local communities and empower those whose voices couldn’t be heard. One way the Foundation is achieving this, and one of the reasons the Foundation appeared on my radar, is their work around news literacy. In a world of 24/7 news cycles and digital advances, the goal of news literacy is to educate and energize citizens—especially youth—about the value of news and assist them in developing a framework for assessing information. In a way, I never took off my journalism hat; I just changed the rest of my outfit. Every day, I’m proud to be a part of this organization and excited to see that through it, I can witness the change I always hoped to be a part of. 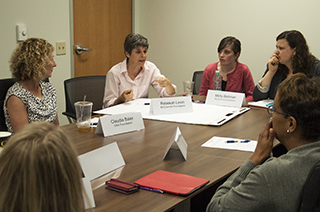 Foundation employees and other funders discuss strategy. As a launch to the Communities Program’s Unified Outcomes Project, over 70 people representing McCormick Foundation grantees, public funders, private foundations and McCormick Foundation staff gathered for an afternoon to discuss evaluation in the areas of child trauma and child abuse prevention. Led by evaluator, Dr. Tania Rempert, the meeting was the beginning of a series of grantee convenings to discuss what outcomes and indicators are most meaningful to practitioners and agencies, streamline evaluation, and provide a forum for agency representatives to talk about evaluation practices at their organizations. 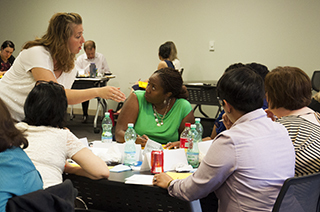 We are hoping that through the upcoming summer workgroups, grantees will learn and share different evaluation approaches and practices that will build on the high-quality services already provided. Through this work, we hope to find common indicators and outcomes the field can use when evaluating program impact (in context with other factors, such as: program models, staff credentials, financial stability, need, barriers, etc. ), and provide the aggregated data back to grantees for benchmarking and continued learning/improvement. Question #1: What kind of support around data collection would you find helpful? Grantees were interested in having computer generated versions of research outcome-based tools that provide responses and indicators, funding for data collection and reporting (including training for new staff), guidance on systems to help analyze the data, access to technical assistance, narrative-based evaluative questions to accompany measurement tools, and a universal database to align data collection. There was also an interest in funders aligning outcome reporting requirements. Question #2: What kinds of outcomes requested/required are NOT HELPFUL? What would you prefer? Grantees wanted benchmarks targets that were based on research, clarity around the City’s questionnaire and correlation with reporting, the opportunity to choose what tools/outcomes are used, more awareness of the “ceiling effect” constraints on child reported outcomes, being able to report on a mixture of qualitative and quantitative data, less focus on outputs which are not as useful as outcomes, and less specific demographic breakdown requirements in reporting. Question #3: What kind of support around evaluation would you find most helpful? Grantees were interested in access to evaluators who could provide on-site technical assistance for creating systems to collect, aggregate, and verify data. Respondents wanted training on participatory evaluation methods and data collection, funding for statistical software and consulting on analyzing outcome data, a library of recommended evidence based tools by category, free evaluation tools, and the opportunity to participate in learning communities to compare and get new tools. From funders, they wanted clarity on minimum and desired expectations, grants to support continuing education in evaluation, training on best practices of administering evaluation tools, ideas for motivating staff to ensure more valid responses , and an easy to use report to pull together all of the data. We were encouraged by the amount of interest and excitement in continuing the project. Over the summer, grantee peer learning groups will be meeting according to program type (Child trauma services in a domestic violence program setting, Child trauma services in a community mental health/private agency setting, and Home-and center-based positive parenting prevention programs) to compare measurement tools and discuss streamlining evaluation. Last August, Chicago Public Schools (CPS), in partnership with the McCormick Foundation and the Spencer Foundation, launched the Global Citizenship Initiative (GCI) in 16 high schools. The GCI is designed to close a “civic achievement gap” as wide as those in reading and math, and to strengthen the civic mission of CPS high schools. Despite a tumultuous teacher strike, extensive principal turnover at GCI pilot schools, and a polarized debate about pending school closings, the GCI penetrated district high schools and prepared students for college, career, and civic life. A senior year civics course debuted at the 16 GCI schools last fall. It was taught by 21 teachers and reached roughly 1,300 students. The course content emphasizes both elections and public policy, and the curriculum leverages proven civic learning practices like discussion and service-learning. Students responded positively to the course. One wrote, "I find my civics class very intriguing. I am learning how to become an active citizen and be a participant in the process of bettering my community." Fourteen of the 16 GCI schools also created student voice committees, where students identify issues of concern in their schools, and work with administration to resolve them. For example, Steinmetz Academy’s student voice committee, led by History teacher David Gonzalez, demonstrated how a malfunctioning metal detector caused student tardiness, and ensured its repair along with a broader revamp of school security measures. GCI teachers completed more than 45 hours of professional development last year, including a weeklong civic boot camp. Community partners, including the Constitutional Rights Foundation Chicago, Facing History and Ourselves, and the Mikva Challenge, supported both the curriculum development and these extensive professional development opportunities. The vast majority of GCI pilot schools (14 of 16) remain committed for the second year of the initiative, and an additional 17 signed on for 2013-2014. The GCI constitutes a massive experiment in urban education to strengthen schools’ civic mission and close the civic achievement gap. Year one was an unqualified success on both counts, and the McCormick Foundation is proud to partner with CPS to insure that no citizen is left behind. Memorial Day is this coming weekend. There are many ways to honor the memory of our service-members who lost their lives serving our country. One of the best ways is to make a donation of any size to the American Legion and wear the Poppy – the memorial flower for our war dead. It’s a tradition which began in the years following World War I. Veterans returning remembered the wild poppies that lined the devastated battlefields, and came to look upon this flower as a living symbol of their dead comrades' sacrifice. All proceeds from the American Legion Poppy sales will go directly to assist disabled and hospitalized veterans in our communities. If you happen to visit Cantigny Park this Friday through Monday, Legionnaires from Cantigny Post 556 will be collecting donations. The proceeds will go to the Midwest Shelter for Homeless Veterans in Wheaton, Ill. and matched dollar-for-dollar by the McCormick Foundation. More than 655,000 Americans have been killed in battle since 1775 (including some 75,000 Confederate war dead), and nearly as many have died in wartime service from causes other than enemy action. Indeed, through World War I, non-battle deaths far exceeded battle deaths. Of the combat dead, nearly 14,000 have died while serving in the 1st Infantry Division of the U.S. Army. The first 200 of those died at the Battle of Cantigny, May 28-31, 1918, a place that was covered with wild poppies that spring. 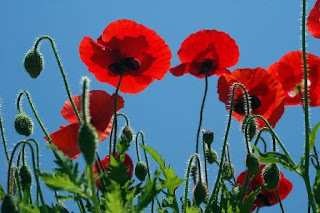 We encourage you to keep this in mind and honor their memory this weekend, or wherever you may encounter some gracefully aging survivors in Legion caps offering you a paper poppy. They were young once, and accepted the risk of youthful death so you and I could live and work as we do. At the end of January, McCormick Foundation CEO David Hiller, Board member Don Wycliff and Communities Program staff participated in the Foundation’s seventh Chicago neighborhood tour to East Garfield Park. The purpose of this initiative is to better understand how McCormick Foundation grantees are achieving impact in some of the most economically disadvantaged communities in Chicago, as well as to learn more about the assets and challenges of these communities. Breakthrough Urban Ministries hosted the tour and discussion in East Garfield Park, which included representatives from grantees Girls in the Game, Inspiration Corporation, UCAN and YMCA. Click above to watch VIDEO on the Communities Program Chicago Neighborhood Tour initiative. Hear our Communities Program Director Bill Koll explain the tour's purpose and get a peek into how one Foundation grantee, Breakthrough Urban Ministries, is committed to making life better in East Garfield Park. In the recent State of the Union address, President Obama said…. "as Americans, we all share the same proud title: We are citizens. It’s a word that … captures the enduring idea that this country only works when we accept certain obligations to one another and to future generations…it remains the task of us all, as citizens of these United States, to be the authors of the next great chapter in our American story." Adding our voices to that story, at the ballot box and in our communities, is a right and responsibility we all share. However, low voter participation, especially among youth, has been a fixture of American politics for years. The Robert R. McCormick Foundation, in partnership with the National Conference on Citizenship, recently released data comparing Illinois Millennials (18-29 year olds) with their national counterparts. The data revealed that Illinois Millennials ranked 30th among their peers in voter registration and 47th for voting in local elections. The good news is there are many efforts underway to reverse these statistics. The Center for Civic Engagement at Northwestern University, a grantee of the McCormick Foundation, is making voter registration more accessible to students through its NU Votes program. The program gives first-year students opportunities to register to vote during orientation week and throughout the school year. NU Votes has proven to be quite successful, registering nearly 95 percent of their first-year students in 2012. Due to the program’s success, Northwestern has begun promoting this model to other schools through an initiative called UVote Project. Last year, UVote worked with eight universities, five in Illinois, to register over 9,000 students before the last presidential election. Programs like UVote are making a real difference in Illinois and throughout the country, but there is still more work to be done. The bottom line is our democracy cannot thrive if our citizens do not have the knowledge and interest to maintain it. If we fail to energize the next generation of citizens democracy itself will be at risk. Over the weekend, I had the opportunity to talk with a group of exceptional high school students who were attending a college readiness program at Wheaton College. The junior and senior high school students were from all over Chicagoland, mostly first-generation, Latino and African-American students from low-income families, and all on a track to graduate high school and go on to college. The B.R.I.D.G.E. program (Building Roads to Intellectual Diversity and Greater Education) will help make sure they get there. Combining a summer residential program on the Wheaton College campus with mentoring throughout the year, B.R.I.D.G.E. helps the students stay on track and navigate this critical transition from high school to college. Click here to learn more about the program. To top off the night, we all attended a marvelous evening of dance and music as part of the Wheaton College Artist Series, featuring the Hubbard Street’s dance company and the Wheaton College Symphony Orchestra. There are a number of great events still to come in the series. Click here to find an upcoming event you are sure to enjoy.